El curs 2011/2012 la Facultat de Matemàtiques i Estadística (FME) està dedicat a Ronald Aylmer Fisher (1890-1962). La Biblioteca de l'FME, per donar suport a aquesta iniciativa, presenta el Web Fisher amb l'objectiu principal de complementar bibliogràfica i documentalment les activitats sobre aquest estadístic que es realitzin a la facultat. Ronald Aylmer Fisher fou científic, matemàtic, estadístic, biòleg evolutiu i genetista anglès. Fisher va realitzar molts avenços en l'estadística, sent una de les seves més importants contribucions, la inferència estadística creada per ell el 1920. L' Espai Fisher és un espai que la Biblioteca de l'FME ha reservat, durant el curs 2011/12, per exposar llibres i altres documents referents a Ronald Aylmer Fisher. Sèrie de 4 postcasts de Ronald Aylmer Fisher i el seu llegat. Un viatge en el temps per aprendre sobre l'estadística inferencial. Aquest vídeo de curta durada, basat en una història real en la dècada de 1920 a Cambridge, Anglaterra, explica com una senyora bevent te britànic va inspirar Sir Ronald A. Fisher, un dels gegants a principis de l'estadística, a pensar en la probabilitat. El vídeo va ser desenvolupat per a la Recerca II: Aplicacions (CCLD 323), un curs en línia que ofereixen a la Universitat de Ryerson, amb l'experiència en el tema del Dr Michael Mueller. Produït per Digital Education Strategies at The G. Raymond Chang School of Continuing Education, Ryerson University. Lady Tasting Tea de la ChangSchool a Vimeo. La misteriosa llei de potències de Taylor. The historical dispute between R. Fisher and J.Neyman. R. A. Fisher: la reconciliació entre la genètica mendeliana,la biometria i la selecció natural. A general procedure for partitioning the overall variability in a set of data into components due to specified causes and random variation. It involves calculating such quantities as the ‘between-groups sum of squares’ and the ‘residual sum of squares’, and dividing by the degrees of freedom to give so-called ‘mean squares’. The results are usually presented in an ANOVA table, the name being derived from the opening letters of the words ‘analysis of variance’. Such a table provides a concise summary from which the influence of the explanatory variables can be estimated and hypotheses can be tested, usually by means of F-tests . A problem concerned with the comparison of the means of two populations having normal distributions with different variances. The problem was first discussed by B. V. Behrens in 1929. Although Behrens's method of solution was unclear, his conclusions were confirmed by Sir Ronald Fisher in 1935. Observational studies can suggest things for which the explanation lies with some hidden variable. For example, the performance of pupils taught in large classes is better than that of pupils in small classes, not because the large class is a more effective learning environment, but because schools operate larger classes for the more able. Experimental design methods seek to control the conditions under which observations are made so that any differences in outcome are genuinely attributable to the experimental conditions, and not to other confounding factors. Some of the most common methods are the use of paired or matched samples, randomization and blind trials. The amount of information that a sample provides about the value of an unknown parameter. Writing L as the likelihood for n observations from a distribution with parameter , Sir Ronald Fisher in 1922 defined the information, I(), as being given by. In mathematics, Fisher's equation, also known as the Fisher-Kolmogorov equation and the Fisher-KPP equation, named after R. A. Fisher and A. N. Kolmogorov, is the partial differential equation. 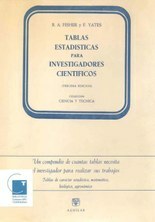 A statistical test that can be applied to data in a 2 × 2 contingency table and is especially useful when the total sample size or some of the expected values are small so that the chi-square test cannot be used. This distribution-free test establishes the exact probability, under the null hypothesis that the row and column variables are independent, of obtaining a result as extreme or more extreme than the observed result assuming that the marginals (the row and column totals) are fixed. It is the prototypical randomization test. Also called Fisher's exact probability test, Fisher-Yates test. [Named after the English statistician and geneticist Ronald Aylmer Fisher (1890–1962) who in 1934 encouraged Frank Yates (1902–94) to develop it]. 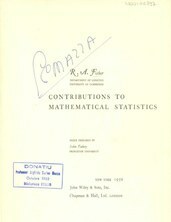 In statistics, Fisher's method, also known as Fisher's combined probability test, is a technique for data fusion or "meta-analysis" (analysis of analyses). It was developed by and named for Ronald Fisher. In its basic form, it is used to combine the results from several independent tests bearing upon the same overall hypothesis (H0). The Iris flower data set or Fisher's Iris data set is a multivariate data set introduced by Sir Ronald Aylmer Fisher (1936) as an example of discriminant analysis. It is sometimes called Anderson's Iris data set because Edgar Anderson collected the data to quantify the geographic variation of Iris flowers in the Gaspé Peninsula. A commonly used method for obtaining an estimate of an unknown parameter of an assumed population distribution. The likelihood of a data set depends upon the parameter(s) of the distribution (or probability density function) from which the observations have been taken. In cases where one or more of these parameters are unknown, a shrewd choice as an estimate would be the value that maximizes the likelihood. This is the maximum likelihood estimate (mle). Expressions for maximum likelihood estimates are frequently obtained by maximizing the natural logarithm of the likelihood rather than the likelihood itself (the result is the same). 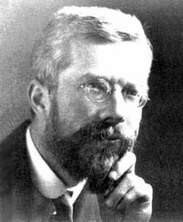 Sir Ronald Fisher introduced the method in 1912.